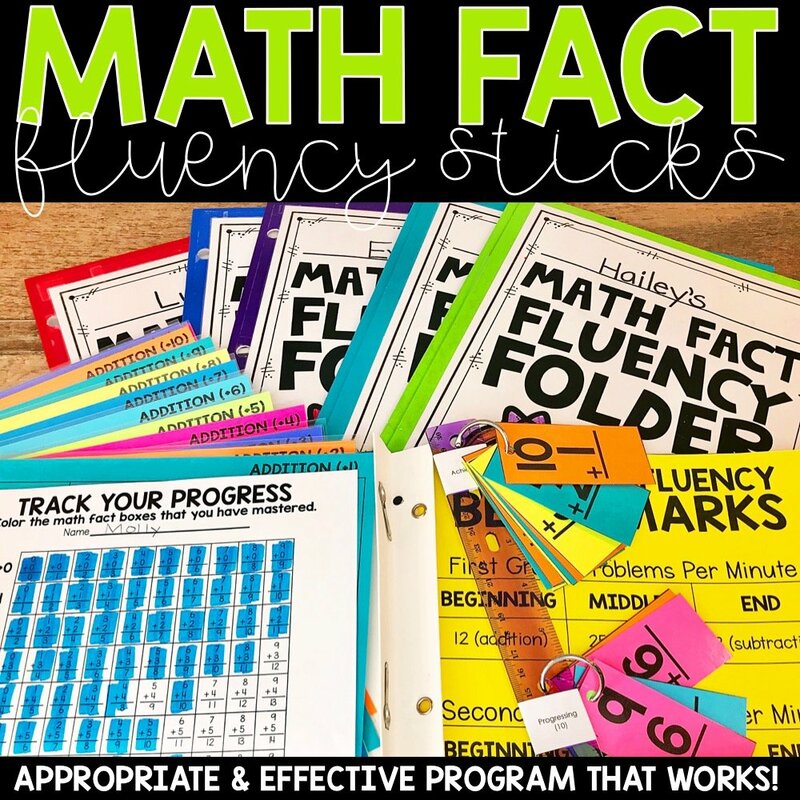 Math Fact Fluency Sticks are a powerful tool for students to use in the 1st grade or 2nd grade classroom. 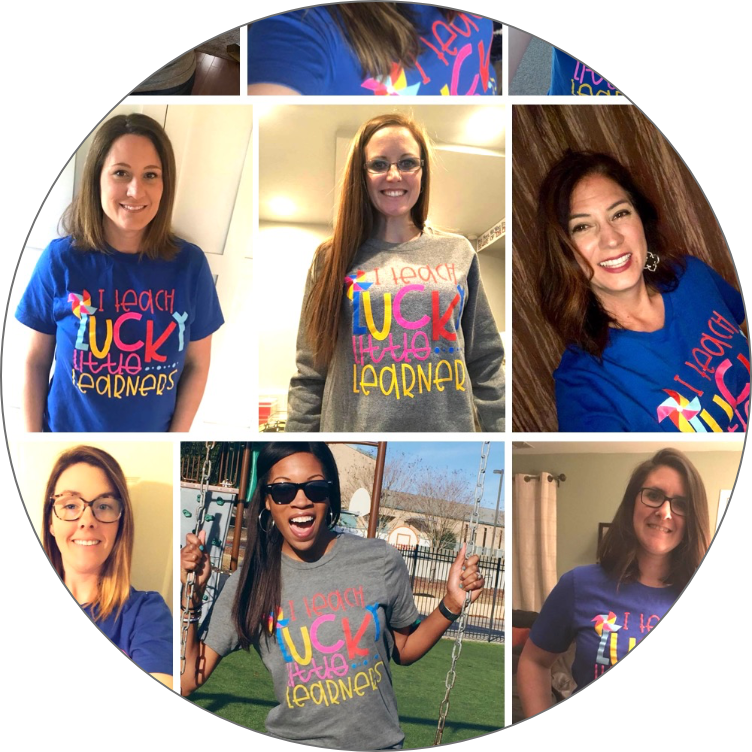 I believe in this system because it is developmentally appropriate, research based, and meets the needs and ability levels of all the students in your classroom in a low stress and low maintenance way. 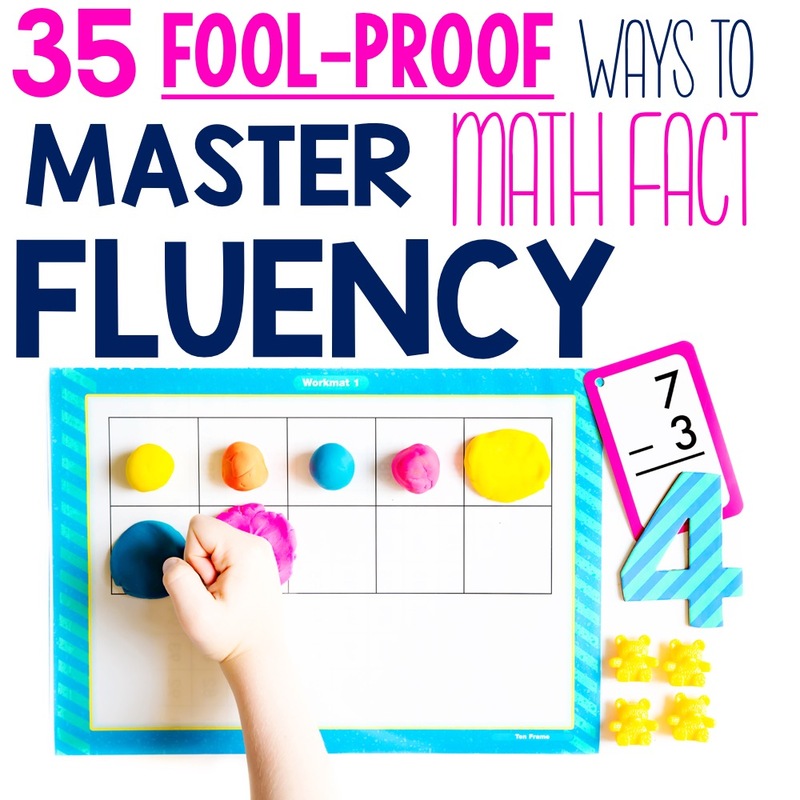 This post is going to go into detail explaining how to use math fact fluency sticks and why they work! To get set up, print all of the sheets of flashcards that you will need. Facts up to 12 are included so if you teach up to 9 or 10, simply cross off the flashcards that aren’t needed. Laminate the sheets and place one of each set in the folder pocket. In the other pocket place the fluency sticks (with labels), progress tracker, and parent letter. Allow your students to do the cutting. Start with the +0 flashcards and work up in sequential order. Strive to have about 20 cards ready to go on the bottom ring (not yet label). Only place 10 cards on the progressing ring at one time. These are the cards that students are practicing daily. 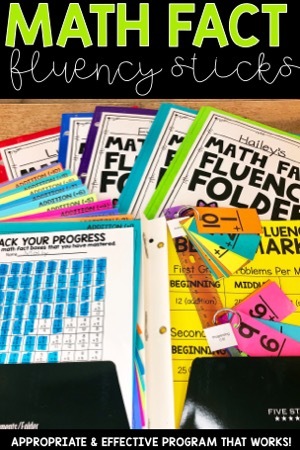 (more than 10 would not be as effective) The top ring is for math facts that are achieved and these flashcards should be revisited a couple times per week. Students will practice the math facts both in class and at home. They make for great homework, math warm-ups, center activities, partner activities, or even early finishers. STUDENTS DO NOT MOVE THEIR FLASHCARDS THEMSELVES. The reason for this is because a teacher must assess them to make sure that they can recall the answer to the math fact within 3 seconds. It is suggested to check in with students about once a week. At that time, the cards that need to be moved can be moved up to the achieved level and the student can color in the fact on the progress checker. It is suggested that the students colors the math fact before moving the fact onto the achieved ring. I strongly believe in this system because it is developmentally appropriate and meets the needs and ability levels of all the students in your classroom in a low stress and low maintenance way. When students focus on ten facts at a time, this sets the child up for success. The student is no longer overwhelmed with a pile of flashcards to practice. The weekly spiral practice of the mastered facts allow for long term mastery. I also love that the program involves the families (although not required) and shows them their progress as well as the benchmarks that their child should strive to achieve throughout the year. 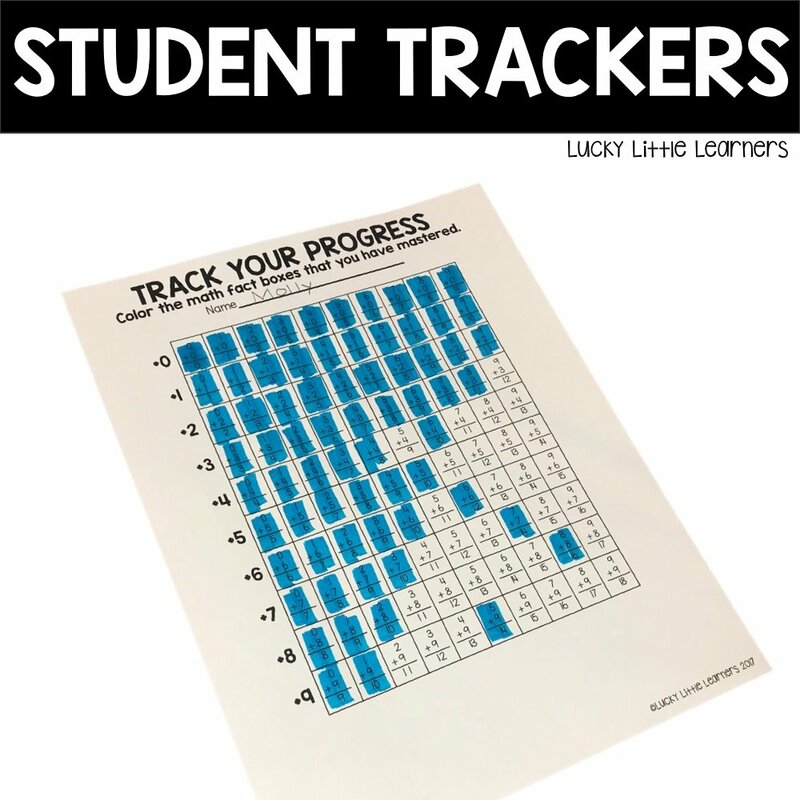 Having students track their own progress not only frees up the teacher’s time but also puts students in control of their own learning. 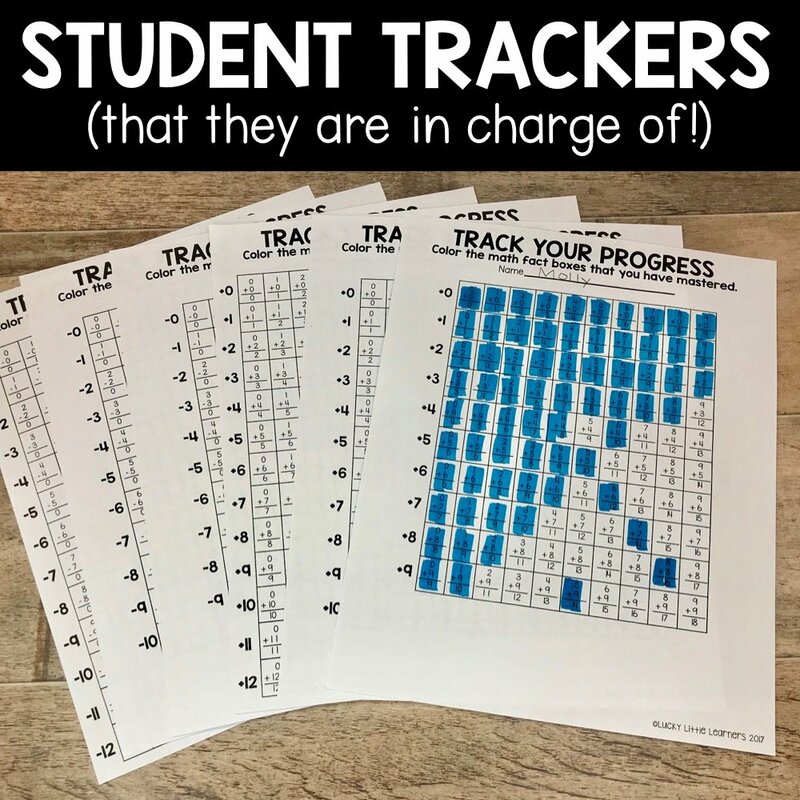 When students track and see their own progress, this is a powerful thing! 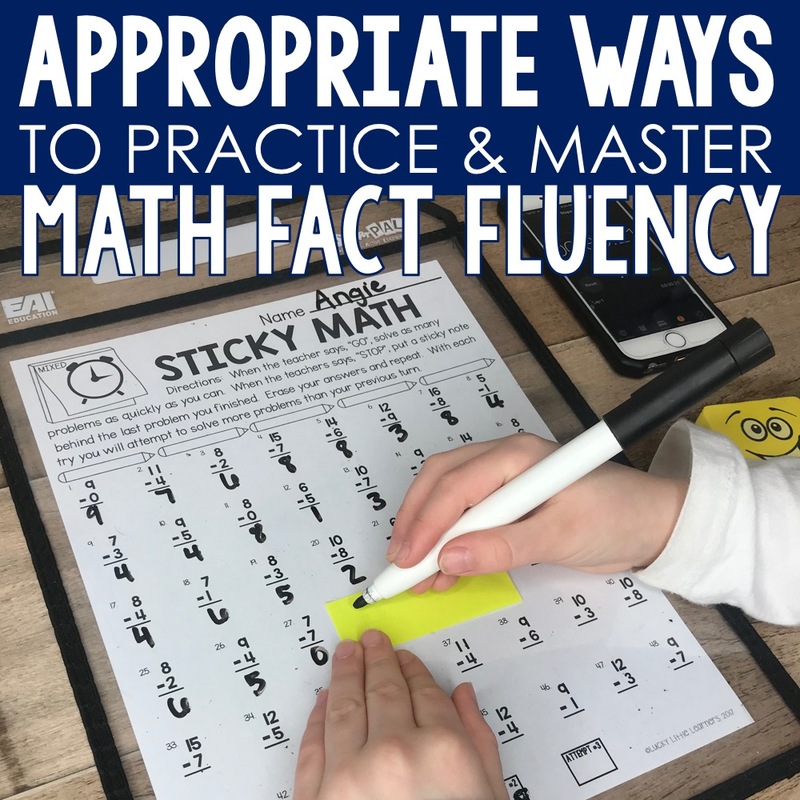 Math fact fluency sticks are a developmentally appropriate, low stress, and low maintenance way to differentiate the content that students need to learn and master their addition and subtraction facts. 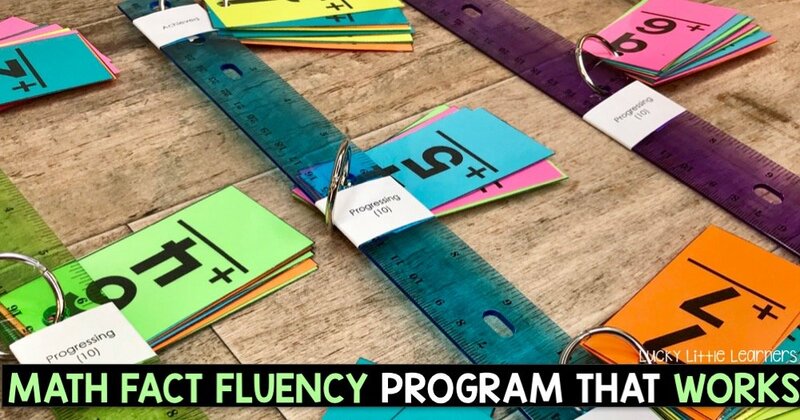 The flashcards for these fluency sticks are provided in this resource. The math problems are available in both vertical and horizontal form. If you have rulers and rings, you are good to go! 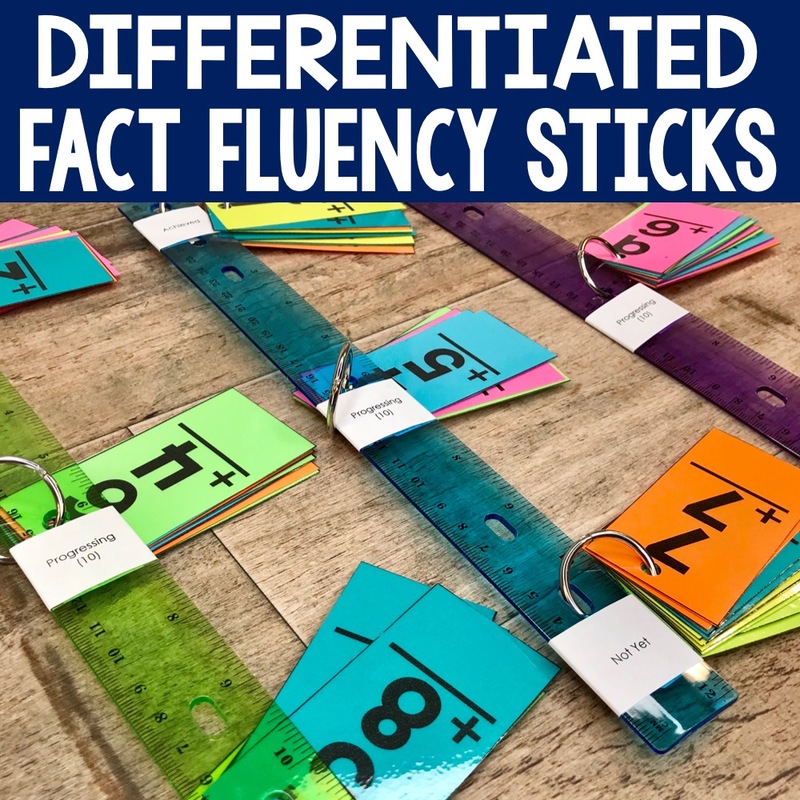 This resource also includes Avery labels for your fluency sticks. These include: Not Yet, Progressing, and Achieved. Each student gets their own math fact fluency stick and it gets stored in his/her fluency folder. Folders are great for storing the fluency sticks, tracking sheets, parent letter, and extra flashcards. 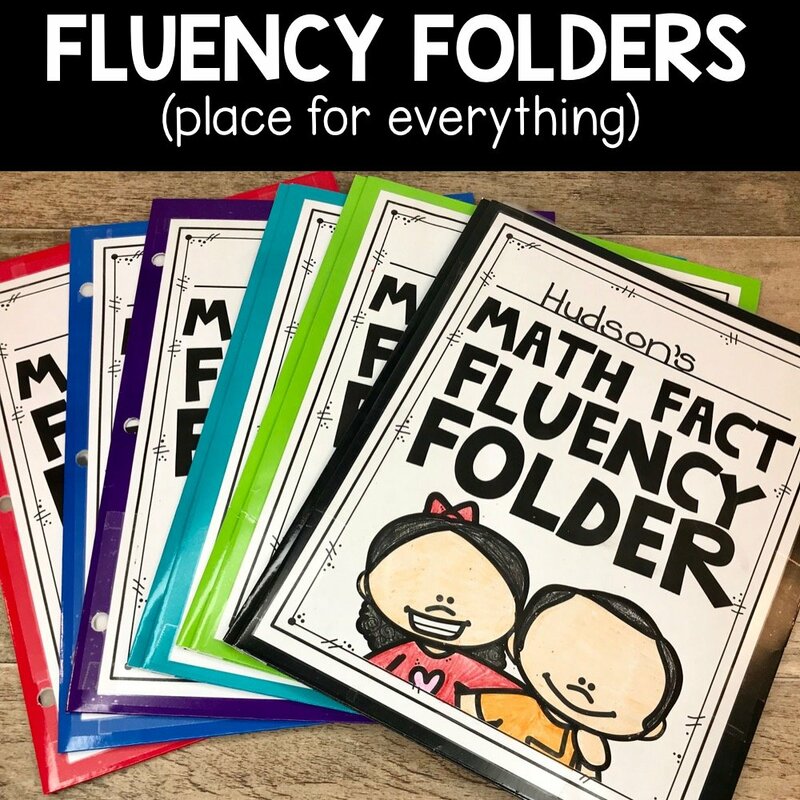 The math fact fluency folder cover is provided in this file. Addition and subtraction tracking sheets are available. Both sets come in facts up to 9, 10 and 12 to meet your students’ needs. The tracking sheets are very visual and meant to be used by the students. Students are responsible for tracking their math facts that they master. This resource explains how this can be done easily and effectively. 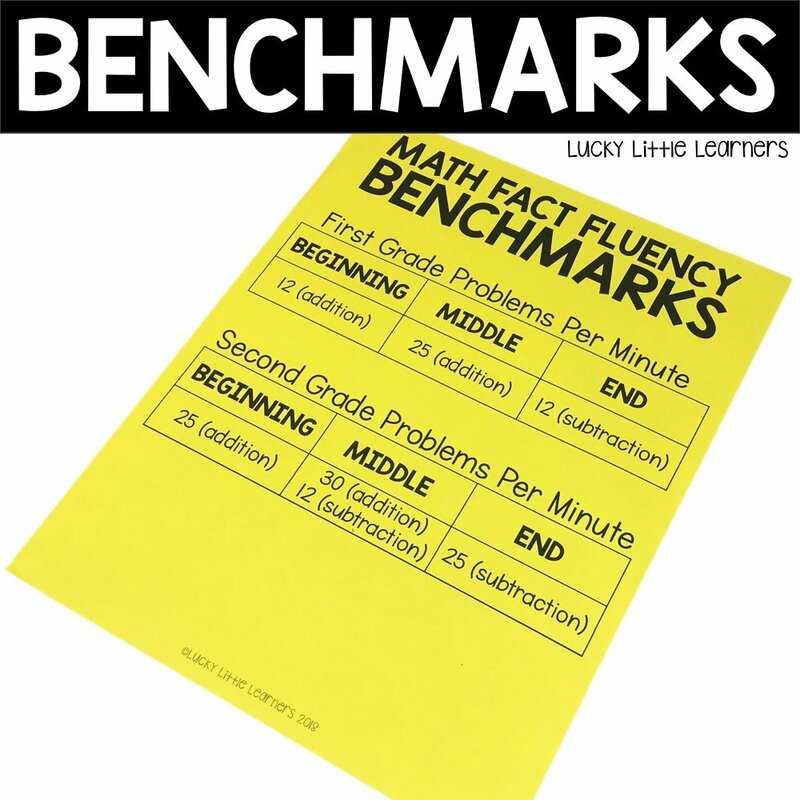 Math Fact Fluency Benchmark sheets are available in this resource as well. These are nice to hang up behind your desk, put in a math intervention folder, or have as a reference at parent teacher conferences. 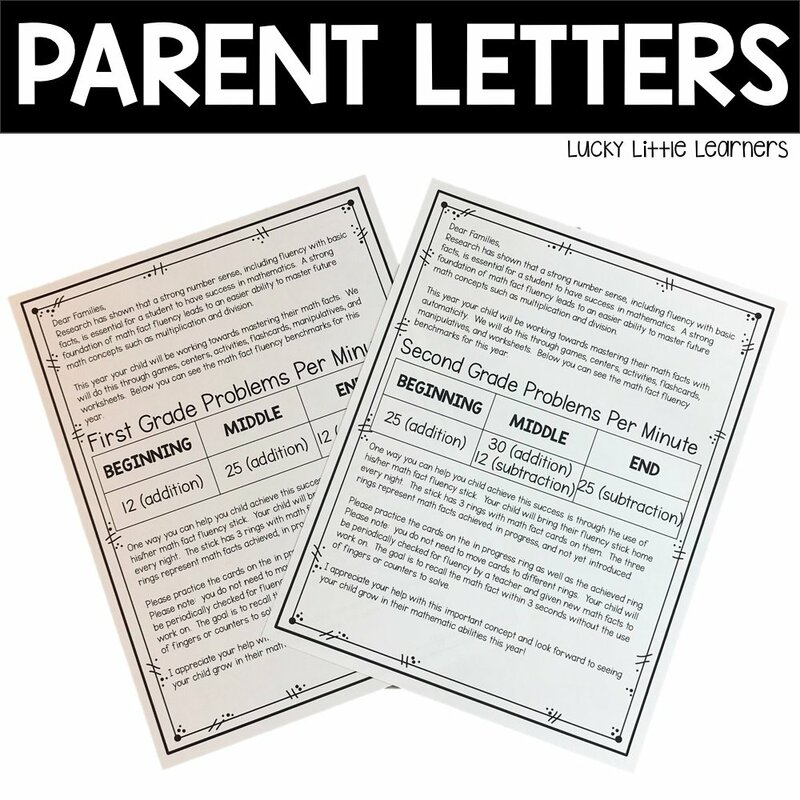 Parent letters are available for both 1st grade families and 2nd grade families. The letter explains the benchmarks for both grade levels as well as the purpose of the math fact fluency sticks. 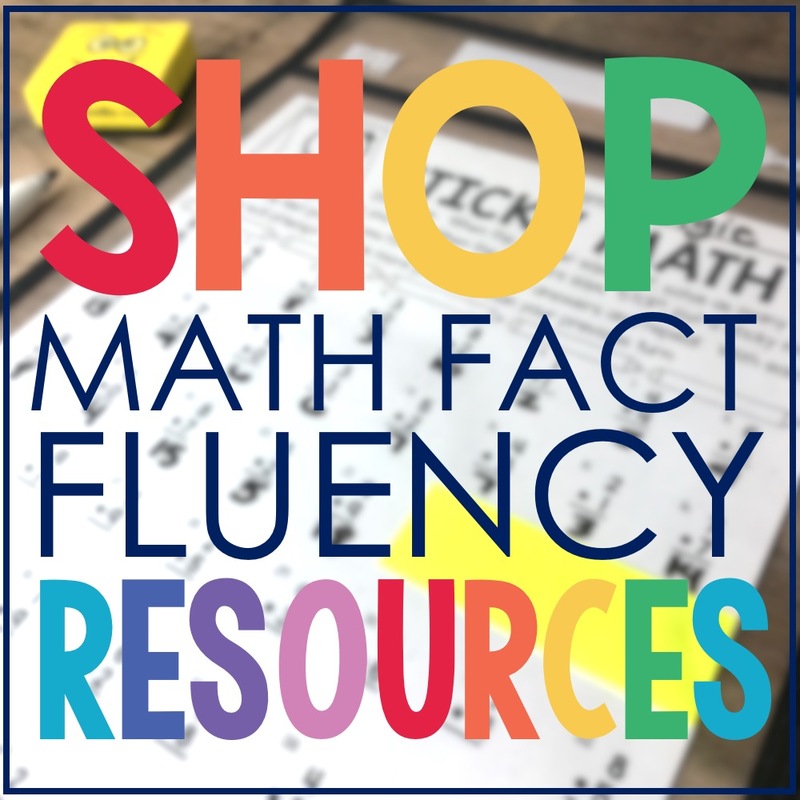 If you’d like to purchase this Math Fact Fluency Program you can do this by clicking here. 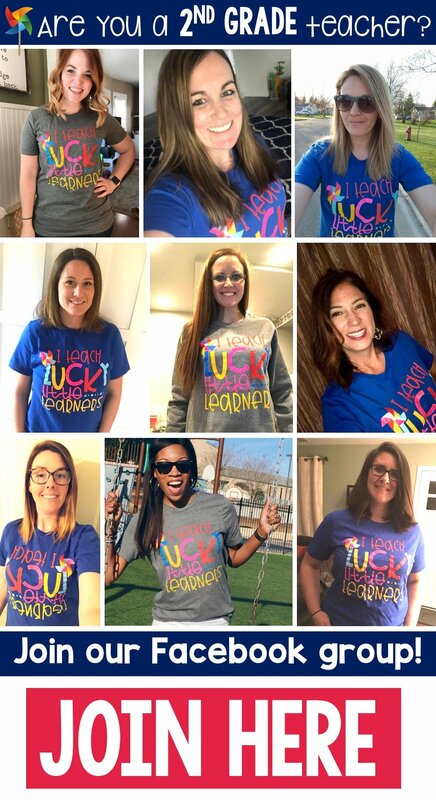 If you’d like to save this idea for future reference, feel free to use the image below to pin to your Pinterest board or click here for an easy link straight to Pinterest. 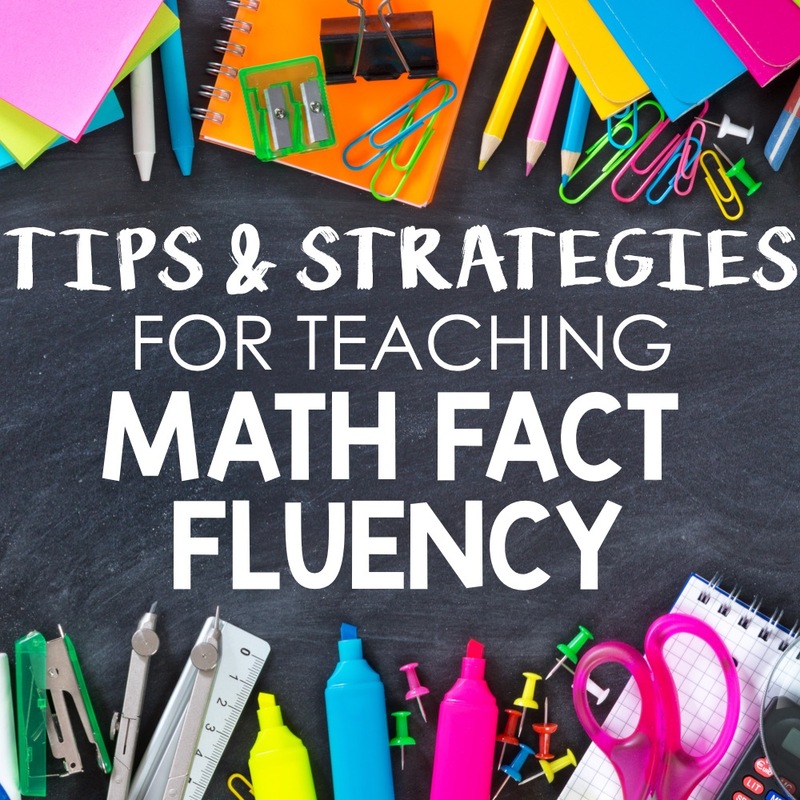 For more math fact fluency activities that you can use in your classroom, check out the video training below. Where can I find your Mental Math? I saw your note tagged as available and labeled Mental Math Strategy in the Sticky Math-but I can’t seem to find it. My mental math pages are marked within the sticky math bundle. I have placed a link below to the bundle itself where it tells you everything included. Thank you for reaching out, I hope this has been helpful! Do you have this for multiplication facts? Love the idea! 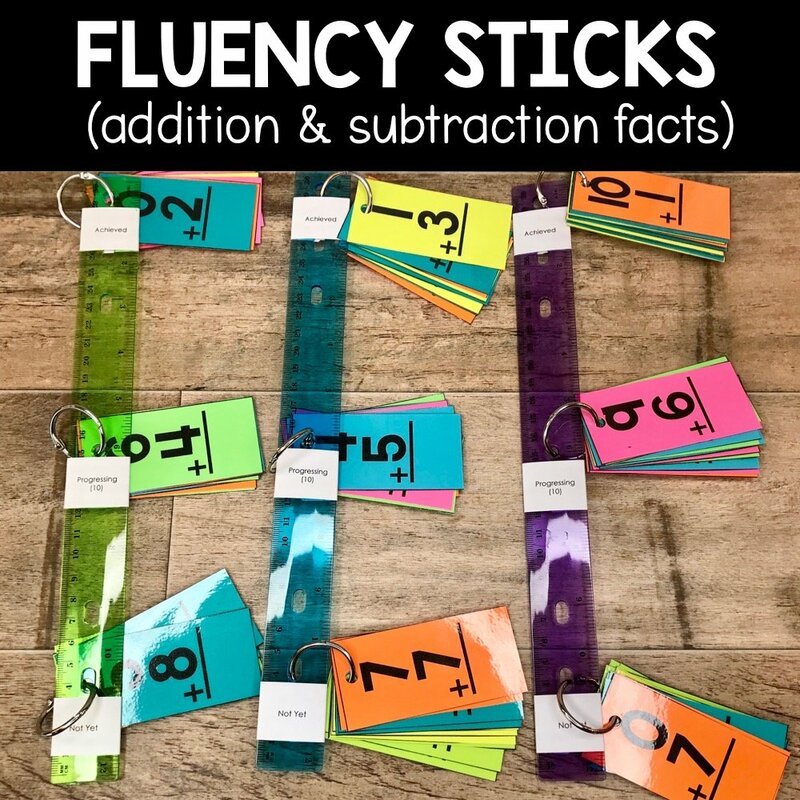 I do have a multiplication set of the fluency sticks available for purchase through TpT! I have placed the link below for you to look over and see if it’s what you are looking for. Thank you, have a great day! I do have a multiplication set of the Fluency Sticks! I have placed the link to them below, thank you! Do you have a set for multiplication?